Pandemnonium reigned inside The Banshee Pub on Dorchester Avenue on Sunday evening as the United States defeated Ghana, 2-1, in World Cup tournament play. Strangers hugged, women were hoisted onto shoulders, and splashes of beer sprayed the room. A small contingent of Ghana supporters on site were offered heartfelt handshakes and conciliatory embraces as images of their vanquished countrymen flashed on the bar’s ten flatscreens. “We want to be a football pub for everybody. That is what we have been from Day One,” said Banshee manager and co-owner Ray Butler. When he and partner Michael Vaughan re-invented the old Vaughn’s bar 17 years ago, they envisioned a classic Irish pub, with few or even no TVs. But that quickly changed because of the lure of sports. Thus began a tradition that made the Banshee the “go to” place for soccer fans well before the 2010 World Cup frenzy took hold. That attention to the soccer community has paid off now that interest in the US national team has broadened. On Monday, an article in USA Today heralded the Banshee as one of the best places in the United States to watch the World Cup games. Quinn says that the American Outlaws — whose signature logo is now emblazoned on the front window of The Banshee— aren’t going anywhere. Another American soccer fan, a member of the Outlaws, credits The Banshee with being the driving force behind his fiancee’s decision to move in with him. “I’m a Dorchester resident. I teach at an unnamed Catholic school on Morrissey Boulevard. I have been here for over 40 US games and countless other sporting events. My fiancee only moved in with me because The Banshee is so close by,” he said. 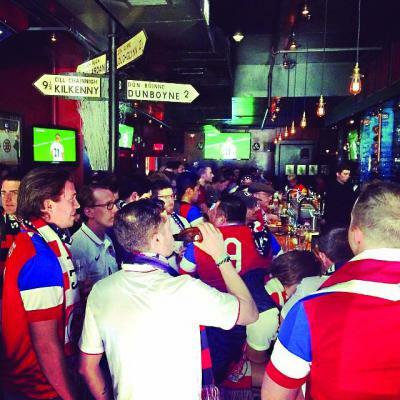 It was all hands on deck on Sunday for the Banshee’s wait staff and doormen as the crowd swelled for the US match. They were prompt and friendly despite the rush as lifelong soccer fans mingled with first- timers and Ghana supporters without animosity. When the US scored its winning goal late in the second half, the two-story building seemed to shake. As the final seconds ticked away, the roof shook to the sounds of leaping, hugging and high-fiving fans. In fact, the Banshee is a good time year-round, long after the soccer lights in Brazil. It’s a home-away-from-home for Green Bay Packers fans and a choice venue for fans of Irish sporting matches of all stripes. It’s also become a favored stop for fans of pub trivia, as Savin Hill native Joe O’Malley runs a popular Wednesday night event. The US will take the pitch again this Sunday at 6 p.m. for their second Cup game, against Portugal. The Americans will face Germany in the third match of first-round action next Thursday (June 26) at 12 noon . The Banshee, which offers an excellent, full menu of breakfast, lunch and dinner, is located at 934 Dorchester Avenue, just south of Columbia Road.